Lesher's Flowers is a family owned and operated business serving the St. Louis Metro area for over 30 years. Lesher's uses only the freshest top quality flowers from around the world. Fresh flowers, plants, silks, balloons and stuffed animals are our specialty with delivery across the street or around the world with no order to large to handle. Order by 11:30 AM central standard time for same day delivery. (Subject to change near flower holidays). Our clientele includes large corporations, small businesses, churches and thousands of individuals. The centerpiece shown here (at left and right) is our First Place Winner at "Over the Top for Tots," at a Luncheon benefiting The St. Louis Crisis Nursery. 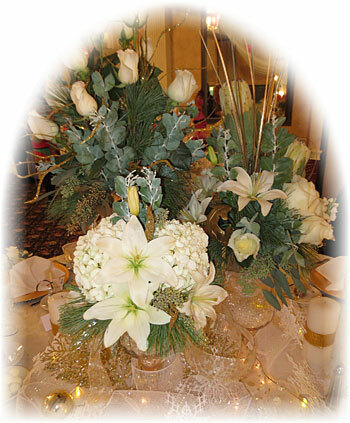 You can trust our creative designers make a beautiful masterpiece for your next event, wedding, celebration, holiday luncheon or dinner, or just to make someone's day brighter! Monday through Friday: 8am to 5:30pm. Visit our store at 4617 Hampton Avenue in St. Louis. Need directions? See the map at right.